I've promised myself to blog twice a week and sometimes it's hard to find the time when I'm starting a business, being a mum and being a narrowboater. A little voice inside me (and Fanciful Alice) says that I should hurry up and finish my book. It's kind of nearly finished; this is an extract that I'm working on at the moment. 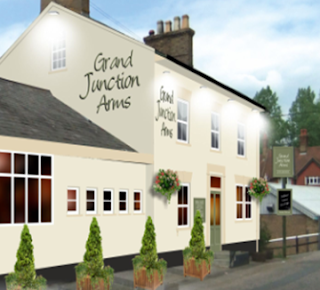 In late August 2011 I finally moored my own seventy foot boat at The Grand Junction Arms in Bulbourne. This is the Tring Summit level of what was The Grand Junction Canal and it marks the beginning of a long leafy cutting that leads down towards Cowroast marina. The way that I remembered it, The Junction Arms was a good old fashioned boaters' pub, built in the mid nineteenth century and still home to old roll-up smoking boaters in waistcoats having impromptu music jams with an accordion in the corner. Bulbourne is a hamlet, consisting of two rows of cottages: one row of cottages along the road, and a row of canal-side cottages at the top of the Marsworth flight. This second row of cottages can only be reached via the towpath, which has been tarmacked in order to allow for the unusual site of the occasional car trundling carefully down the towpath outside the window of our moored boat. The first time I ever came to the Grand Junction Arms it was bustling with boaters after the Wendover 2000 canal festival. Myself and my new-found boating friends sat in the beer garden admiring the BW canal workshops opposite, which in those days were still working and had been making lock gates since 1810. “I'd like to make a lock gate one day,” said Rufty Tufty Biker Boater, with a cheeky grin. He was a carpenter by trade. I nodded in admiration. I thought it would. But he never did, because in 2004 the yard closed down forever. At least the pub is still open, I thought to myself. I left the girls on board with The Doctor and popped in for old times sake and to see if they had a copy of Towpath Talk. As I walked down the towpath I noticed that there was a lovely old painted boat moored in front of us, called 'Cressy' which reminded me fondly of days gone by. Once, this place would have been a welcome stop for the horse-drawn boatman, providing stabling and refreshments when the horse and crew grew tired. When the invention of motor boats allowed for longer working days many traditional canal-side inn's went out of business; without the need to rest a tired horse the boats carried on cruising far into the night. They needed to work hard just to make ends meet. The story continues when I actually go into the pub and meet a mysterious olde worlde gentleman at the bar.